A winter trip to Alaska means a real adventure that challenges you physically and mentally. Your physical condition needs to be well enough to handle long-hour winter activities, while you have to stay positive about harsh winter conditions. For most travelers, it is not the extreme climate prevents them from visiting Alaska; it is, rather, their attitudes and reactions toward it make them reluctant to travel. In reality, you would have more fun if you traveled to Alaska in winter. After living in Hawaii for a year, I decide to take a trip to central Alaska at the end of December for a white Christmas holiday. 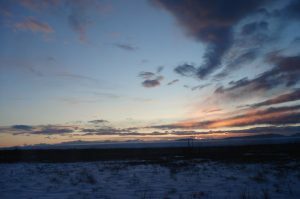 Most of my friends think either I was insane or forgot what winter looks like, but there I was, at Fairbanks International Airport, having to rent a car and driving on the snowy and icy road for the rest of the 10 days. When I headed out around 9:30 am, I found out Fairbanks was neither dark nor as cold as I was expected. 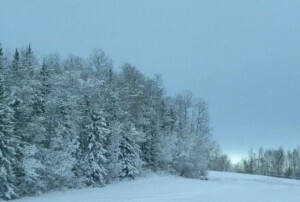 Winter brings 6-7 hours of daylight to Fairbanks with average temperate around 15°F. For Alaskans, winter is when the real fun begins. They partake in all kinds of winter activities, including dog mushing, snowboarding, snowmobiling, moose hunting and northern lights viewing, to embrace the mother nature of the last frontier. You cannot leave Alaska without trying scrumptious Alaska King Salmon. I fell in love with Alaska’s salmon during the dinner at my host family, and believe it or not. It was one of the reasons I came to Alaska. I remember spent 3 hours to catch a salmon in North Pole under snarling wind. My host family advised me to wear heavy winter coat and bonnie boots to keep me warm. However, after an hour spent on the snow ground I still felt freeze to death, but I sat still and stared at the hole intently. Three hours later, I felt my hook gets heavy. I waited for a few seconds and then reeled the hook in. There is a red salmon eating the bait! I felt a strong sense of accomplishment. At the end of the day, the host family invited us to dinner. I was so thrilled when I saw my salmon severs as one of the main courses on the dinner table that night. If you are a seafood lover in Alaska, then ice fishing is one of the winter activities you want to do. There is nothing tastier than a freshly caught salmon, especially when you caught it yourself. One cannot pass up the opportunity to visit Santa on Christmas holidays. This time we extend our holiday experience to the Santa Clause House. Although the store is operated only between 5pm to 6pm on Christmas Eve, we were so excited that we can finally meet Santa. Santa Clause House is truly an unique place to visit where you can immerse yourself in a real Christmas ambiance and enjoy a home-made hot chocolate. We found amazing Christmas presents and souvenirs that made in Alaska, as well as a wide collection of unique toys. We purchased a stack of postcards and sent them to our friends from Santa Clause House. We also met the real member’s of Santa reindeer team as well as took pictures with Santa’s sleigh in front of the house. Over 2 million children has received Santa’s letter over the past sixty years. Thousands of kids also write letters to Santa annually. There are letter walls displaying the letters sent by children from all over the globe. There is something you can never refuse to experience in winter Alaska: enjoying an outdoor hot tub at Chena Hot Spring Resort is definitely one of them. I got a quick dip in the hot spring after dinner. It was extremely cold outside. Hot water kept my body warm. My hair and eyebrows were frozen with icicles forming on them after exposed in the open air. I looked like I was eighty as my hair was frozen to a snow white color. However, I am addicted into the outdoor pool since it allows me to hang loose while watch the breathtaking Milky Way overhead. 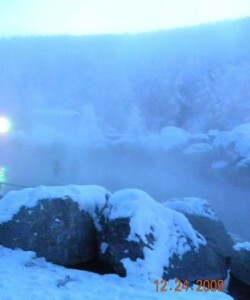 If you are in Fairbanks Alaska during the winter season, Chena Hot Spring Resort is the place to go. Pristine winter landscape, great ambiance, starry sky, and unforgettable outdoor hot tub are what all this about. Expect to walk from the dressing room to the hot tub (10 meters) with only your swimming suites on under -20 degree. Then you may be surprised to find out that you are as though as most Alaskans. Before stepping out, you can choose to warm up a bit in the indoor swimming pools. Aurora Borealis on Christmas Eve Did I mention how cool it was to witness the glimpse of Northern Lights myself on Christmas Eve? Believe me, this was the best Christmas present I have ever received, and that is the major reason why travelers from all over the world flock into Fairbanks Alaska in winter holidays. It was Christmas Eve. There was no snowing, the sky was crystal clear, and the North Star was hanging low. I soon realize this was a perfect weather condition for northern lights show up. 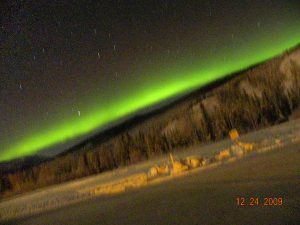 There is an Aurora Viewing room at the fitness center in Chena Hot Spring Resort for visitors wait for the northern lights. When we saw an eerie green light across the mountain around 12:30 am, we all run outside and the lights started shape-shifting. A green band of light danced in the northern sky in different forms for more than 3 hours, and no one wanted to leave till the lights totally disappeared. We did not care how freezing it was outside, because the moment we saw the magical display, the weather just does not matter to us. Remember the Christmas movie Polar Express? The following day of the winter solstice, we headed out to Anchorage by riding the Aurora Winter Train reminiscent of Polar Express. Winter train fares from Fairbanks to Anchorage are $159 each way, there is a different schedule for each season. More specifically, from the end of September to early May the train only runs on weekends. The total trip takes 12 hours because the train is designed for sightseeing purpose only. Many people I met on board are very curious about Alaska winter landscapes. Instead of driving on the dangerously icy and snowy road, we all believe that the train allows us to saw classical scenery in a hassle-free way: admired North America tallest mountain Mt McKinley, saw the permafrost and jagged snow-capped mountain, crossed the creeks and valleys, witnessed mousses and bald eagles, passed through Sara Palin’s hometown Wasilla, and appreciate the wonders of the sunrise and sunset. The train is clean and efficient, and the staff and the conductor are warm and helpful as they gave us detail information about famous attractions along the way. When comes to incredible natural landscapes and wild animals, they even stopped the train and give us plenty of time to take pictures. I’d recommend Alaska Railroad trip to everyone, irrespective of their age and financial status. Do not plan any other significant activities or trips on the same day of the train ride as the train would probably be delayed due to the weather conditions. My last but not least discovery on my winter visit to Alaska was Seward Highway. This world’s most scenic byway, linking between Alaska largest city Anchorage and coastal community Seward, is an appealing road trip that all Americans are encouraged to undertake. Many people prefer to travel on Seward Highway in summer; however, winter adds charm and beauty to this road. 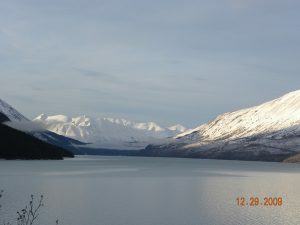 We traveled through Seward Highway at the end of December, looking the breathtaking inlet on one side and jagged peaks on the other. The landscape becomes more dynamic under the sunset. We made numerous stops along the way, looking for waterfalls, blue glaciers, snow-capped mountains and stormy ocean fjords, and trying to fill our hard drive with postcard quality pictures. We also spent some time to explore Turnagain Arm and Portage Glaciers. There are not so many tours available during the winter season, so we just walked along the shore and enjoyed a close up view of the iceberg. If you are keen on the outdoor activities, I’d recommend you to experience cross-country ski and mountain biking, which are popular in Alaska. After that, you may say you have had true Alaskan winter experience. A friend of mine born and raised in Alaska once said “if you want to meet real Alaska, you want to come in winter”. I have visited Alaska several times in summer as well, impressed by the midnight sun and diversified summer landscapes, but I miss the winter more. There are never-ending list of places to go and things to do in Alaska during winter, and there is always something novel for you to discover. 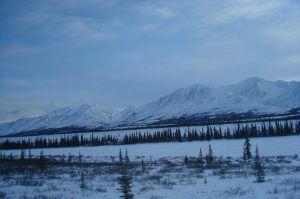 You are never tired of winter Alaska since it has plenty to offer, no matter how dreadful the winter seems. Hi Sonia, thank you! You comments mean a lot to me! Alaska is def a winter wonderland and I am afraid if you go you will probably do not want to leave haha. Have a great journey and wish you get to see the active Aurora Borealis! Hey Julie Cao your information is impressive and inclusive on Alaska winter. 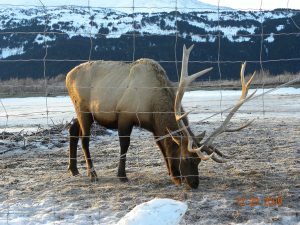 How to find traveling companion to experience Alaska winter. I am 68. I will be attending a conference in Toronto from 4th Dec for about a week. After the conference is over I am taking the Canadian Rail to Vancouver. I intend to take a flight to Anchorage from Seattle on 18th December to experience Alaska winter. To share cost, gas, accommodation etc. Just wondering how cold it was when you were in Alaska? How much did you wear? I’m going there during Christmas this year and trying to prepare warm jackets like Canada Goose for it. But as I am living in LA where we don’t need Canada Goose at all, I’m still debating whether getting it or not. Thanks! Hi Grace, it depends on where you will be visiting in AK. I really do not remember the exact temperature in Fairbanks as I dont dare to check :), but you do need Canada Goose if you decide to watch Aurora Borealis as you will be outside during midnight for hours. If you plan to do ice-fishing and dog-sledding,the tour company usually offers you extra cloth and the boots for you to stay warm on the icy cold weather. If you travel south like Anchorage and Seward, it is not really that cold. Sometimes it can warm up to above zero degree. Just be sure to wear layers and winter boots. I wore three layers on the top and two on the bottom. For me the most struggle part is not the cold, it is the lack of the sunlight (less than four hours per day in Fairbanks). 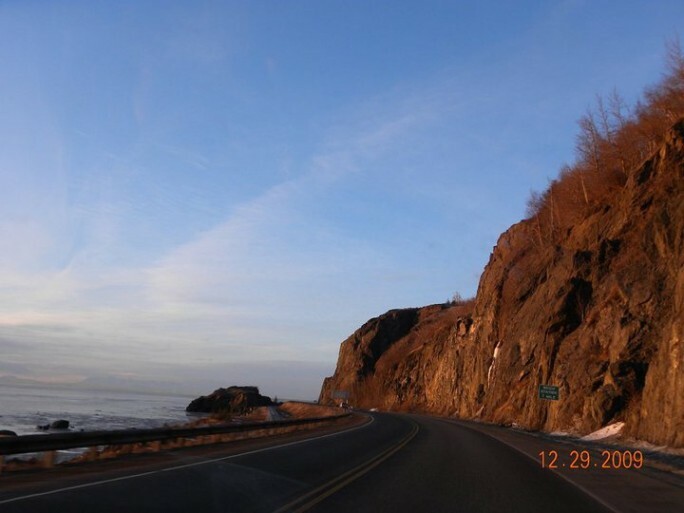 Is it okay drive from anchorage to Seward in late December? Hi apologize for the late reply. I just saw your comment. My friend and I drove from Anchorage to Seward during the day, and it is safe. I dont recommend that you drive that road at night as it can be dangerous, because if the temperature going down the road can be foggy.